Figure 1. Tanaka Miyoji (1861-1890): John and Bessie Robinson (1888). Source: RBSC, UBC Library: RBSC-ARC-1757-PH-4418 (Click to enlarge, or visit source here). Click here to visit the UBC John Cooper Robinson Photo Collection. 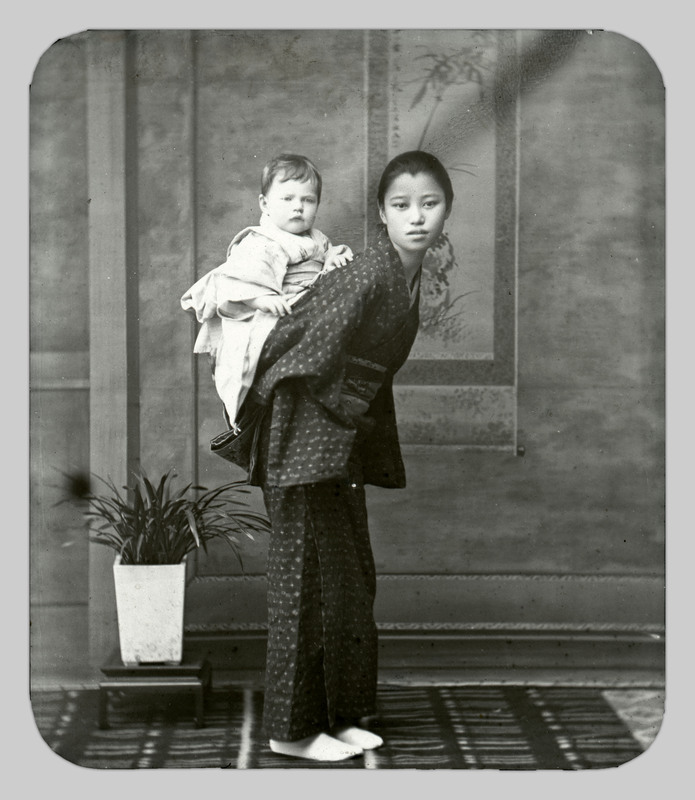 In late autumn of 1888, shortly after their arrival in Japan, John and Bessie Robinson posed for a photograph in the Tokyo studio of Tanaka Miyoji (figure 1). 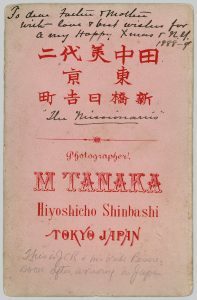 Though he had been in business for barely one year, Tanaka had already adopted several protocols used by nearly every commercial photography studio that catered to foreigners. 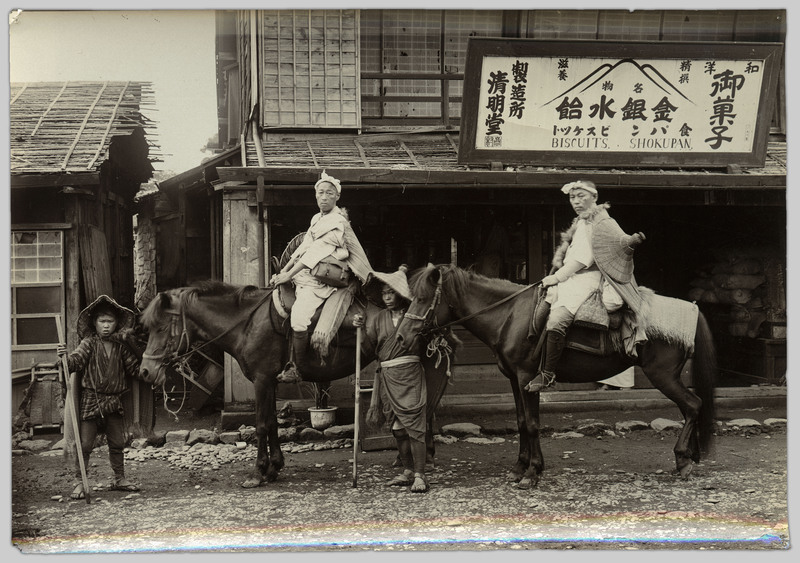 The jinrikisha in which Bessie is seated and the painted backdrop of a bucolic country scene were typical of the props commercial photographers employed to create Japanese environments required to memorialize the travels of their foreign clientele. Studios employed models, in this case a male posing in the role of a jinrikisha coolie, to add yet another layer of authenticity to the staged portrait. 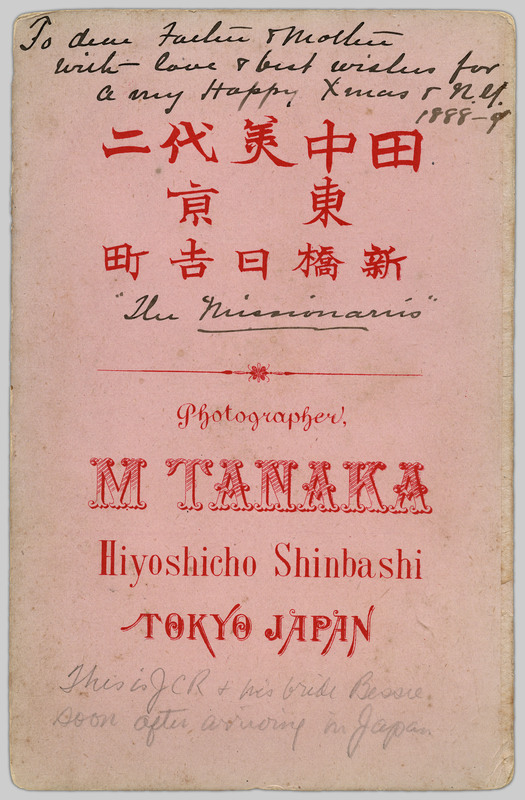 Not wanting to pass up an opportunity to advertise, Tanaka added his name and the address of the studio in both Japanese and English on the reverse side of the photograph (figure 2). Figure 2. 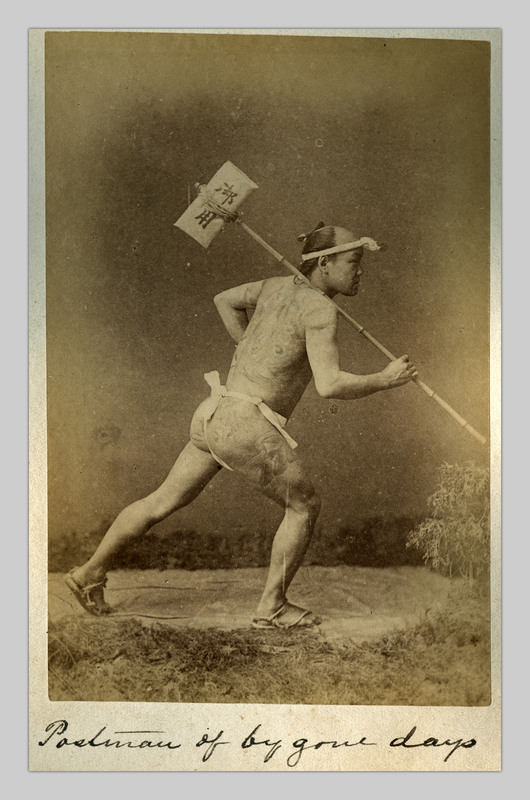 Tanaka Miyoji (1861-1890): advertisement on the reverse side of Figure 1. Source: RBSC, UBC Library: RBSC-ARC-1757-PH-4418. (Click to enlarge, or visit source here). John or Bessie added a hand-written Christmas greeting to the back of the photograph that reads “To dear father and mother with love and wishes for a very happy Xmas and New Year, 1888-9.” A brief caption reading “The Missionaries” speaks to the importance of the photograph as a marker of the first foreign posting for the missionary couple. 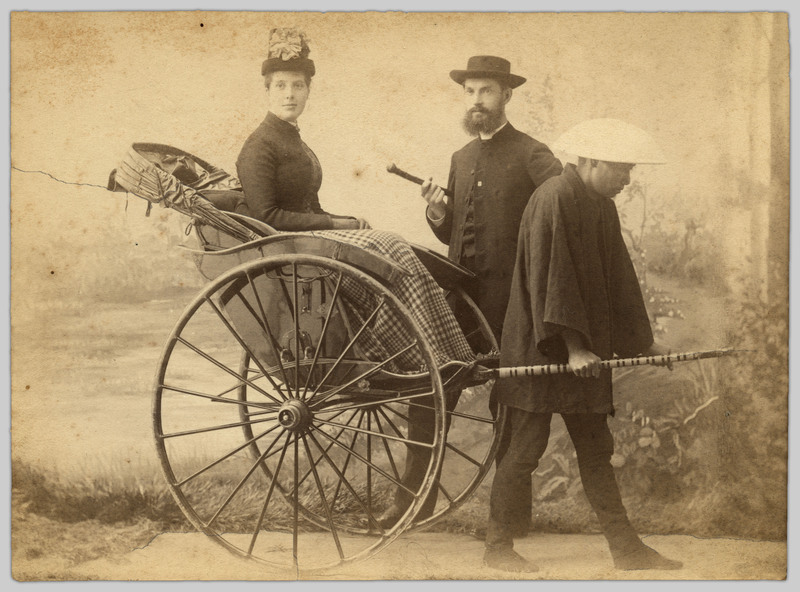 The handwritten note at the bottom that reads “This is JCR and his bride Bessie soon after arriving in Japan” was added later by an unidentified author. While Tanaka’s portrait photograph of John and Bessie commemorates the inception of their decades long residency in Japan, it simultaneously marks the beginning of a relationship between Robinson and Japan’s burgeoning commercial photography economy. 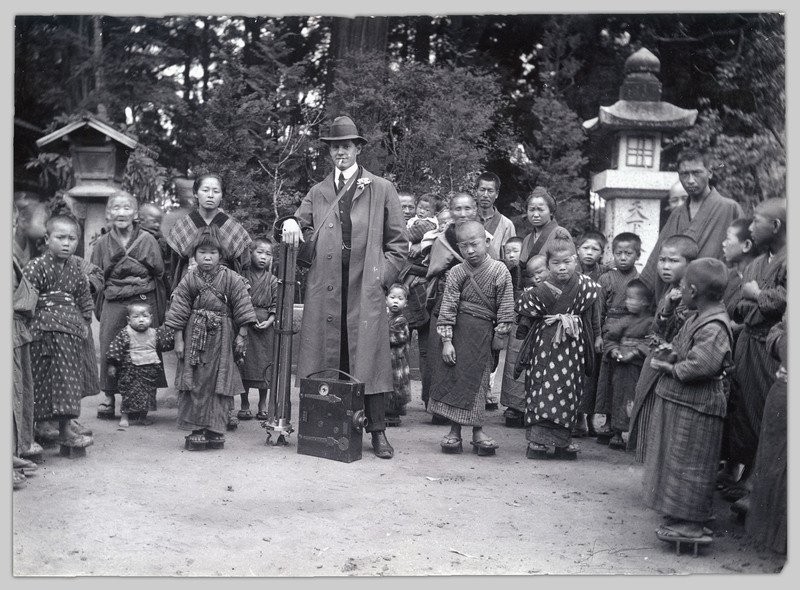 Robinson was a highly productive amateur photographer, and like all amateur photographers working in Japan during the late nineteenth and early twentieth centuries, he relied on commercial photography studios for a range of products and services. The UBC Robinson archive thus provides an unprecedented opportunity to examine the relationship between a prolific amateur photographer and the commercial studios necessary to pursue his passion for photography. Figure 3. Photographer unknown: Robinson and unidentified companion adjusting a camera. Source: RBSC, UBC Library: RBSC-ARC-1757-PH-1436, click to enlarge (Click to enlarge, or visit source here). Two photographs in the UBC archive offer glimpses of the cameras Robinson used. One shows a group of curious onlookers gathering around Robinson and an unidentified male as they adjust a camera sitting atop a tripod (figure 3). A second shows Cuthbert Robinson (John’s son) leaning on a tripod with a large-format, folding camera at his feet. A crowd of spectators gathers round Cuthbert with many following his lead and posing for the photograph (figure 4). While we do not know the precise makes and models of the two cameras featured these photographs, their sizes and the fact that both utilize tripods suggest that they were dry plate travel cameras that first came onto the market in 1878 and remained popular well into the early twentieth century among both amateur and professional photographers. 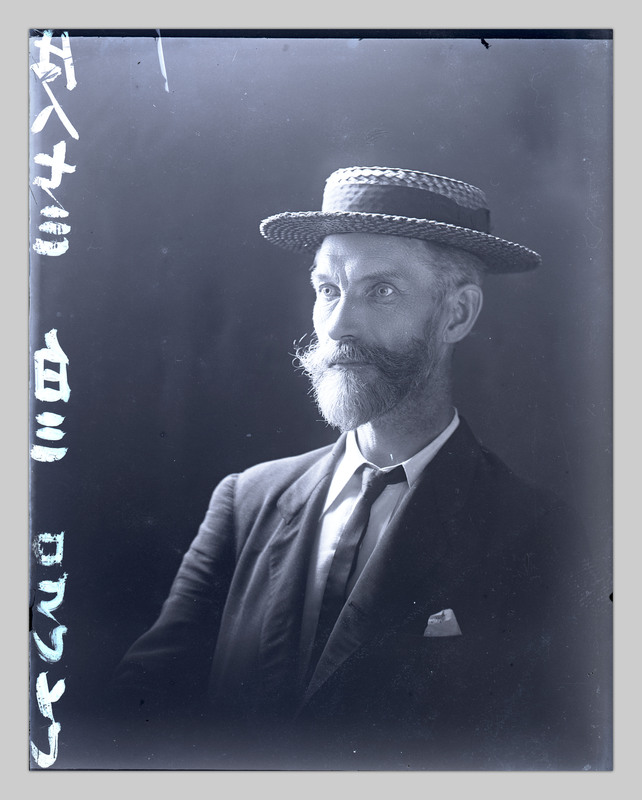 Prior to the late 1870s, photographers used wet collodion technology, a cumbersome process that required them to coat a glass plate with photosensitive collodion, insert the plate into a camera, take the photograph, then process the plate immediately after exposure. This multi-step operation required several chemicals and a well-equipped portable darkroom (usually a tent). Dry plate cameras used commercially manufactured glass negatives that had been pre-coated with an emulsion of photosensitive gelatin then baked to ensure their durability. Dry plates could be stored after exposure and developed later at the photographer’s convenience. Figure 4. Attributed to John Cooper Robinson: Cuthbert Robinson (John’s son) posing with a large format camera. Source: RBSC, UBC Library: RBSC-ARC-1757-PH-4491 (Click to enlarge, or visit source here). The 700 glass plate negatives in the UBC archive indicate the importance of dry plate cameras to Robinsons’ amateur practice. However, nearly twice as many film negatives (1362 in total) reveal that Robinson also used film cameras extensively. In 1888 the George Eastman Company of Rochester NY introduced its first Kodak camera. These small, inexpensive cameras came preloaded with a 120 exposure, celluloid roll film. Amateur photographers would send the camera back to the Eastman Company where the film would be developed. The company returned to the photographer the negatives, printed photographs, and the camera, into which a new roll of film had been installed. During the 1890s the Eastman company introduced several modifications to both its cameras and roll film technology. The debut of the Kodak Brownie Camera in 1900 and development of roll film cartridges that photographers could load into their own cameras equipped amateurs with a basic but versatile kit that would remain popular well into the mid-twentieth century. The UBC archive has a photograph of a young woman at a missionary gathering holding a Kodak Brownie. Robinson’s large cache of film negatives were probably obtained with a similar camera. Sources of dry plates and roll film would have been essential for Robinson’s photographic practice, and evidence suggests that he would have had relatively easy access to these products. 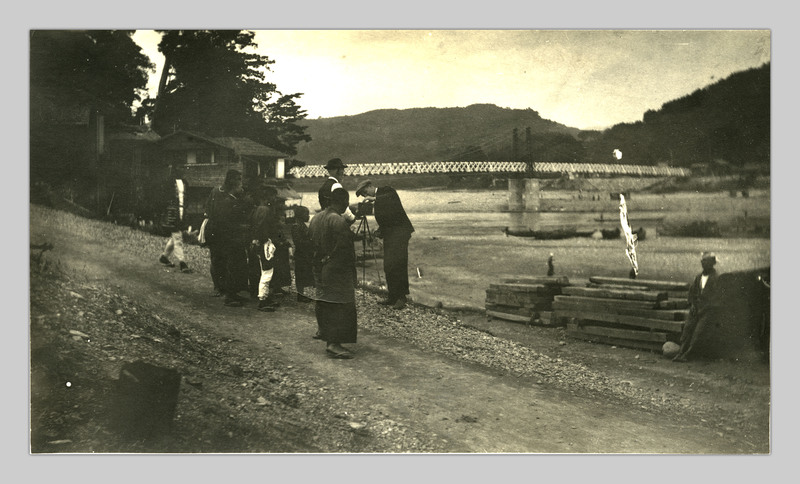 Scholars of early Japanese photography have documented the existence of more than one thousand commercial photographers working during the Meiji period (1868-1912). Most of the commercial photographers known to scholars thrived in Japan’s largest cities and five treaty ports frequented by foreign travelers. Advertisements placed by commercial studios in tourist guidebooks, news publications, and business directories affirm that by the first decade of the 1900s, two of Yokohama’s largest studios (operated by Kusakabei Kimbei and Ogawa Kazumasa) were selling Kodak cameras, roll film and dry plates. Robinson could very well have purchased supplies from one of the larger firms but ninety-three of the known commercial photographers worked in the so-called Canadian diocese (a region of Japan encompassing Niigata, Nagano, Gifu, and Aichi prefectures) to which the Missionary Society of the Church of England in Canada (MSCC) assigned Robinson. Far less is known about these photographers but evidence in the UBC archive suggests that some studios in the Canadian diocese had the capacity to supply Robinson with the products he required. Figure 5. 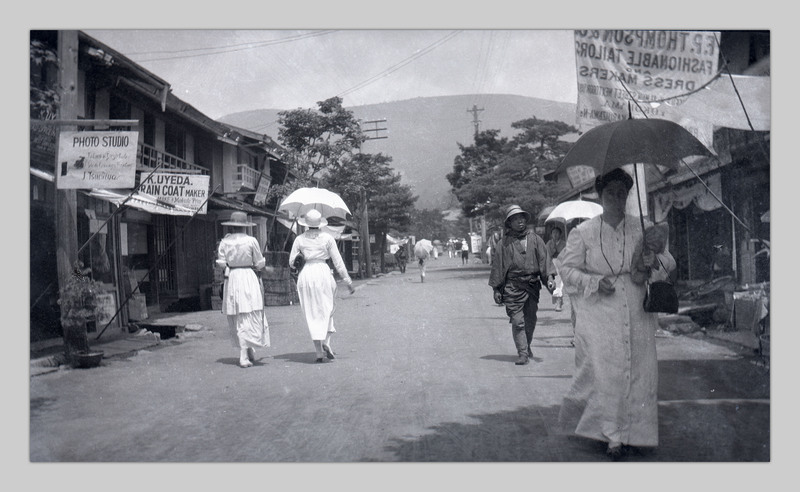 John Cooper Robinson: Main Street Karuizawa, Nagano Prefecture. Source: RBSC, UBC Library: RBSC-ARC-1757-PH-2812 (Click to enlarge, or visit source here). right side. Source: RBSC, UBC Library: RBSC-ARC-1757-PH-2873 (Click to enlarge, or visit source here). From their inception in the early 1860s to well into the twentieth-century, the financial viability of Japanese commercial photography studios depended on the sale of scenic views and costumes. Scenic views typically depicted historic and/or cultural sites such as temples, shrines, villages, traditional neighborhoods, and natural wonders. Costumes refers to depictions of Japanese people wearing traditional Japanese dress and engaged in common cultural practices. 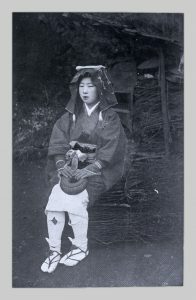 Portraiture, such as Tanaka photograph of the Robinsons (figure 1), provided an important secondary source of income. The advent of amateur photography in the late 1880s gradually altered the business practices of most commercial studios. Advertisements continued to emphasize inventories of views and costumes as well as portraiture, but studios also began offering services for amateur photographers such as developing, printing, hand coloring and even access to darkroom facilities. Evidence in the UBC archive indicates that Robinson regularly used the services commercial studios offered amateurs. 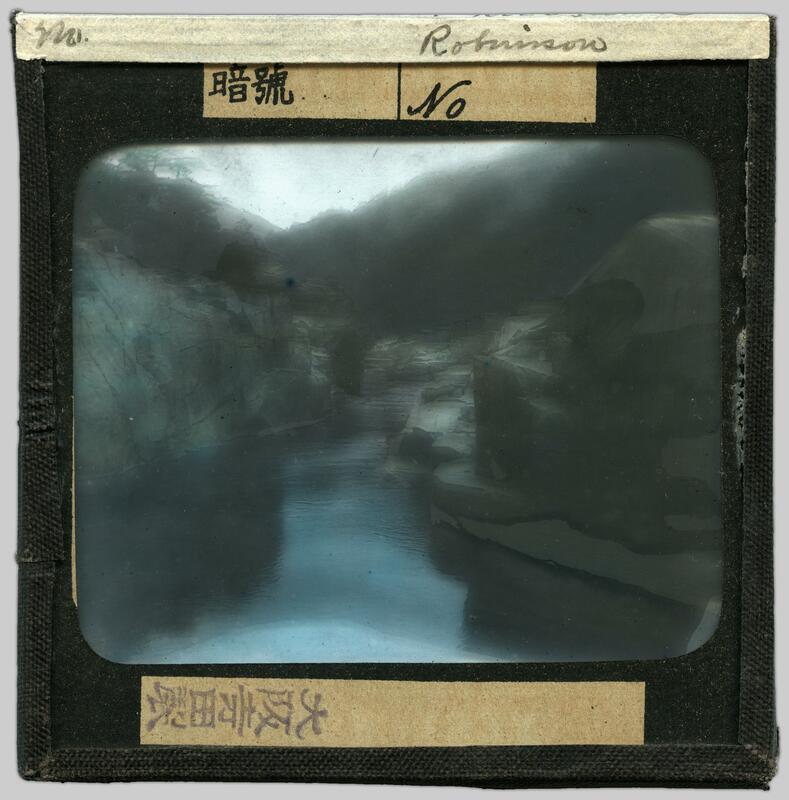 Handwritten Japanese notations on some of his negatives indicate that Robinson relied on commercial studios to develop his films and glass plates (figure 6). 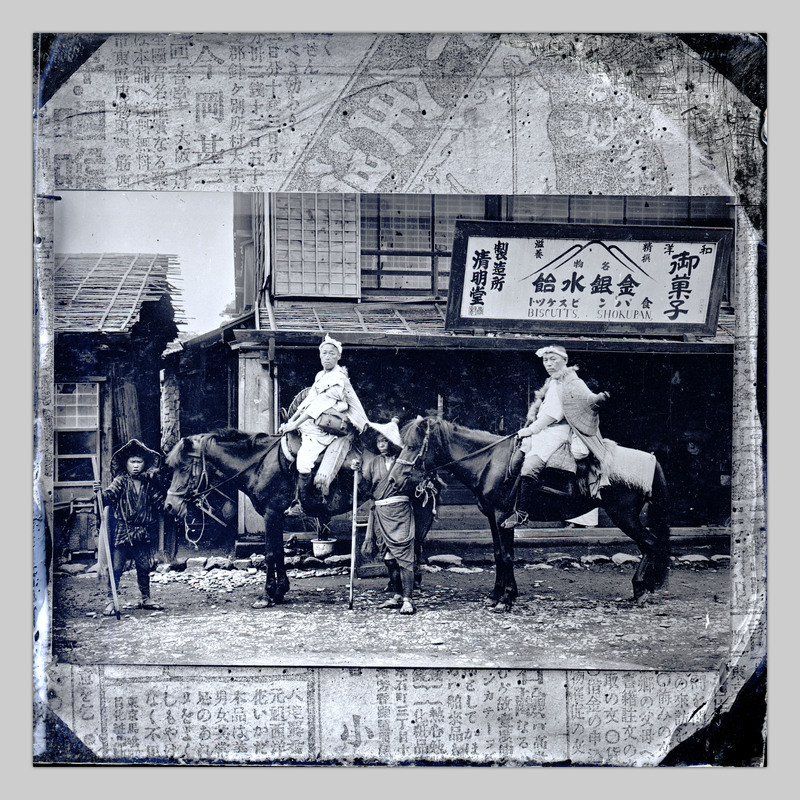 Japanese commercial photographers were highly regarded the world over for their expertise at hand coloring photographic prints and glass-lantern slides. A label attached to the back of one of Robinson’s slides depicting a scenic spot along the Kisō River in Gifu Prefecture reads “made by Terada (of) Osaka” (Osaka Terada-sei). Figure 7. John Cooper Robinson: Kisō River. Source: RBSC, UBC Library: RBSC-ARC-1757-PH-2684 (Click to enlarge, or visit source here). Figure 8. Reverse side of Figure 7. Source: RBSC, UBC Library: RBSC-ARC-1757-PH-2684 (Click to enlarge, or visit source here). The introduction of collotype printing to Japan in the late 1880s enabled inexpensive mechanical printing of halftone images. By the late 1890s and early 1900s several commercial photographers began to offer collotype printing to amateur photographers. 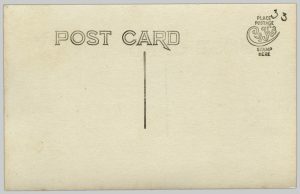 Up until the late 1890s national postal services throughout the world retained monopolies on post card production. In 1898 many national postal services loosened their restrictions and began accepting commercially made postcards. 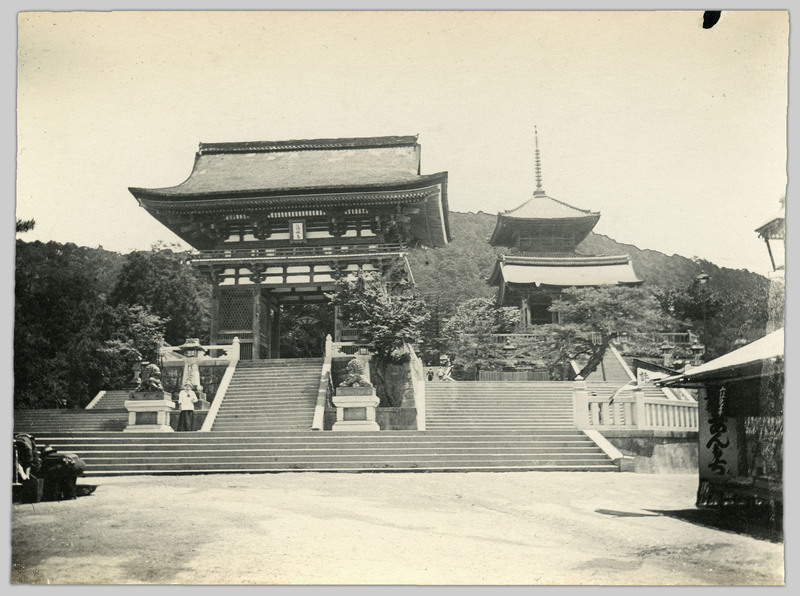 Advertisements indicate that by 1905, commercial photographers in Japan had added collotype-printed postcard production to the suite of services they offered amateur photographers. Robinson availed himself of this service and commissioned several postcards printed from his film and/or glass negatives (figures 7 and 8). The UBC archive contains a little over two hundred postcards featuring Robinson’s photographs. Some images appear on several cards, suggesting that Robinson commissioned multiples of photographs he particularly liked. Figure 9. 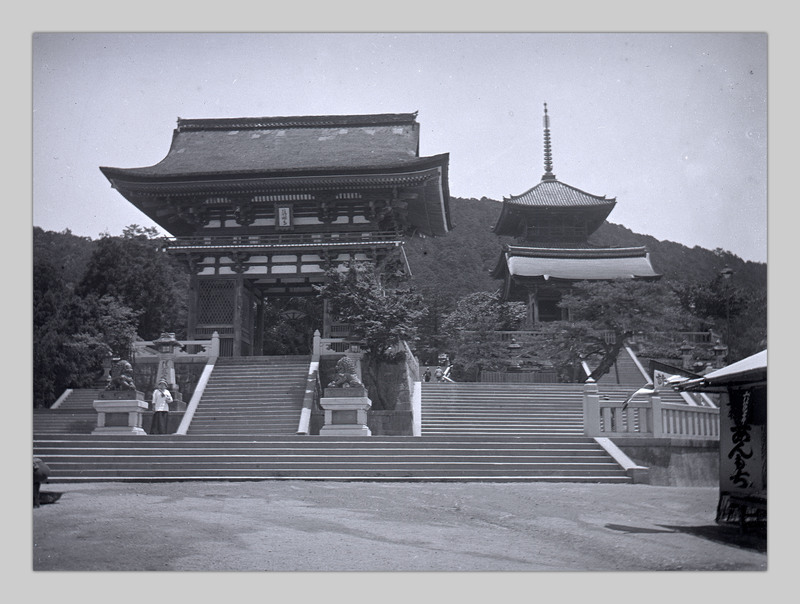 John Cooper Robinson: glass negative showing Robinson’s daughter Hilda near the Main Gate of Kiyomizudera in Kyoto. Source: RBSC, UBC Library: RBSC_ARC_1757_PH_2662 (Click to enlarge, or visit source here). Figure 10. John Cooper Robinson: collotype postcard printed from the glass negative showing Robinson’s daughter Hilda near the Main Gate of Kiyomizudera in Kyoto (figure 9). Source: RBSC, UBC Library: RBSC-ARC-1757-PH-1517 (Click to enlarge, or visit source here). Tanaka Miyoji’s 1888 portrait of John and Bessie (figure 1) was only the first of several trips the Robinson family made to commercial studios to commission professional portraits. 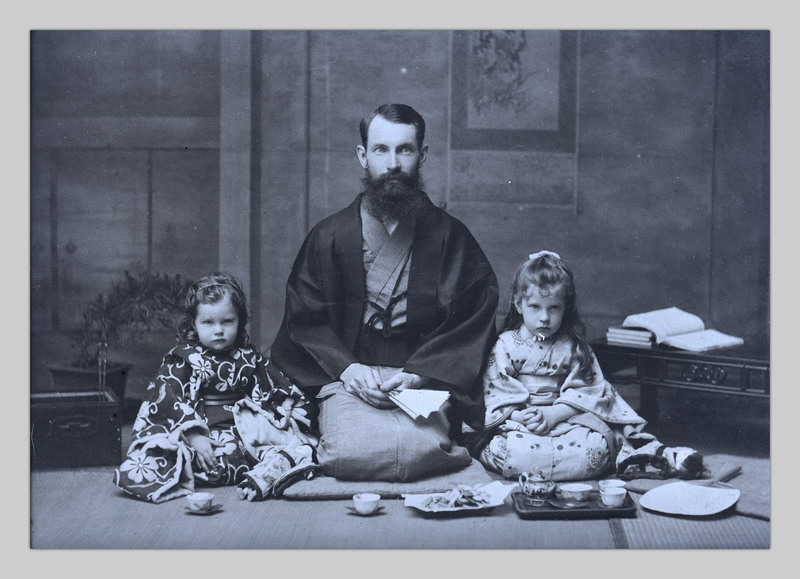 A portrait of John and his daughters Lucy and Hilda shows the family dressed in traditional Japanese garments and sitting in formal seiza posture on tatami (figure 11). Figure 11. Miyashita Kin: Robinson with his Daughters Lucy and Hilda. Source: RBSC, UBC Library: RBSC-ARC-1757-PH-1907 (Click to enlarge, or visit source here). Commercial studios indulged foreigners’ fascination with cultural cross-dressing by stocking a selection of Japanese costumes they could don for a portrait. The studio is furnished with traditional Japanese items to enhance the authenticity of the scene. Bonsai appearing behind Hilda on the left balance the low lacquer table and books beside Lucy on the right. A sencha tea set and a round fan (uchiwa) are laid out in the floor in front of the Robinsons while a hanging scroll (kakemono) depicting the traditional literati them of rock and bamboo hangs on the wall above John’s left shoulder. The name of this studio proprietor, Kin Miyashita, appears along the right edge of the negative. Miyashita was one of twenty-one commercial photographers operating in Nagoya where Robinson’s mission was particularly active. The inventories of commercial photographs also provided Robinson with access to contemporary subjects that would have been virtually impossible for him to photograph. The UBC archive contains several commercial photographs that Robinson purchased, then re-photographed with his own equipment. 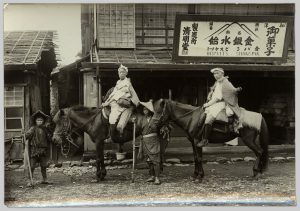 Figure 12: Unknown Photographer: Travelers on Horseback with their Grooms. Source: RBSC, UBC Library: RBSC-ARC-1757-PH-4421 (Click to enlarge, or visit source here). Travelers on Horseback with their Grooms (figure 12). Source: RBSC, UBC Library: RBSC-ARC-1757-PH-2167 (Click to enlarge, or visit source here). The commercial version of a photograph showing travelers on horseback posing with their grooms in front of a village shop features light green color added by hand to the roof and upper story of the background structures (figure 12). One of Robinson’s glass negative shows this very photograph laying down on a newspaper (figure 13). For centuries women from the tiny mountain village of Ohara carried large bundles of sticks on their heads in to Kyoto to sell as fuel. Oharame, as they were known, wore a highly distinctive costume. Robinson acquired and copied a commercial photograph of an Oharame (figure 14: RBSC-ARC-1757-PH-1843 , the original photographer’s Japanese caption appears in the lower margin). Robinson’s glass negative shows the pins he used to secure the photograph to a board. Both the newspaper and the pock-marked board appear in Robinson’s copies of other photographs. Once Robinson secured the glass negative he could reproduce the commercial image for his own needs. In his interactions with commercial studios, Robinson would have had countless opportunities to peruse through commercial inventories of scenic views and costumes. He would have seen firsthand, subjects and themes oriented specifically to the proclivities and predilections of foreign tourists—the primary clientele of commercial studios. We must ask, then, what impact, if any, did studio inventories have on Robinson’s photographic practices? At some point during his long tenure in Japan, Robinson purchased fifty hand colored photographs from commercial inventories and had them bound into a small orihon-style album to which he added his own descriptive captions Some of his choices indicate that he subscribed to common stereotypes held by most foreign tourists who visited Japan. 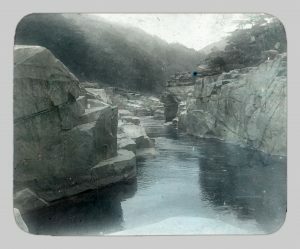 photograph of a Kyoto Oharame. Source: RBSC, UBC Library: RBSC-ARC-1757-PH-1843 (Click to enlarge, or visit source here). 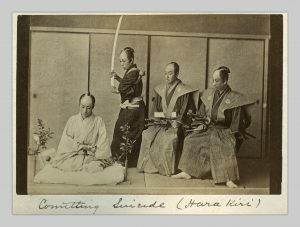 “Committing Suicide (hara kiri)." Source: RBSC, UBC Library: RBSC-ARC-1757-PH-1190 (Click to enlarge, or visit source here). “Postman of bygone days." Source: RBSC, UBC Library: RBSC-ARC-1757-PH-1190 (Click to enlarge, or visit source here). 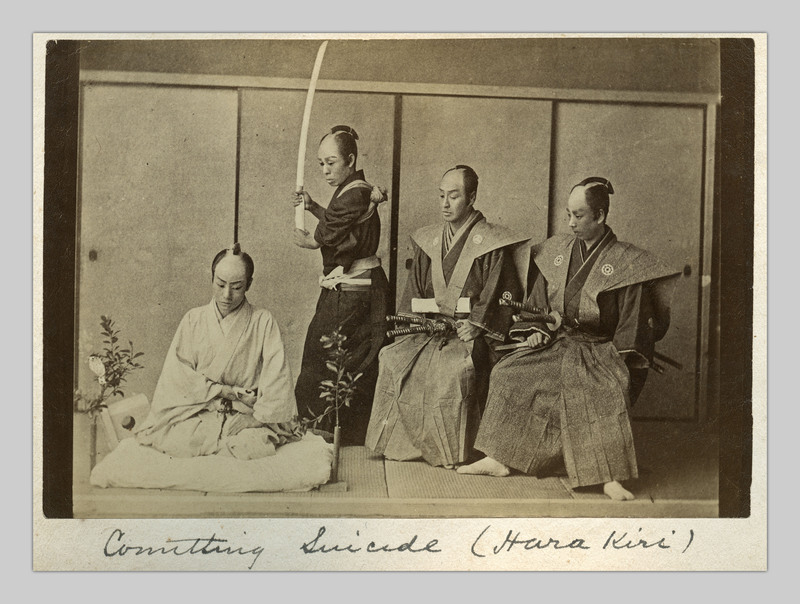 Two of the commercial photographs Robinson purchased had long histories in the inventories of commercial photography dating to the early 1860s when tattooed postmen were a fact of life and foreigners were fixated on the samurai act of ritual suicide (harakiri). The props, painted backdrops, actors, and fake blood used to stage these photographs attest to the impossibility of actually witnessing such subjects, as does the reference to “bygone days” in Robinson’s caption for the tattooed postman (figure 15 and 16). 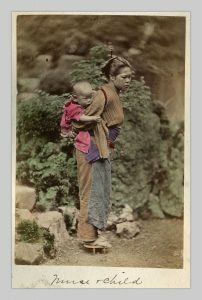 Robinson’s album of commercial photographs includes four images of young women carrying children on their back (figure 17). Travel and residency accounts authored by foreigners frequently comment on this practice. Many accounts are illustrated with commercial photographs such as the examples in Robinson’s album, or engravings based on them. Robinson was clearly fascinated with this practice. He commissioned a portrait from the Nagoya studio of Miyashita Kin featuring a hired model holding his daughter Hilda (figure 18). Figure 18. 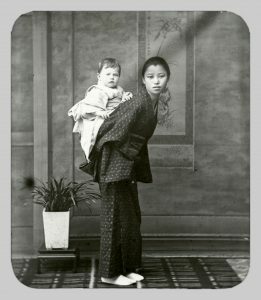 Miyashita Kin: Studio Model Holding Robinson’s Daughter Lucy. Source: RBSC, UBC Library: RBSC-ARC-1757-PH-3028 (Click to enlarge, or visit source here). 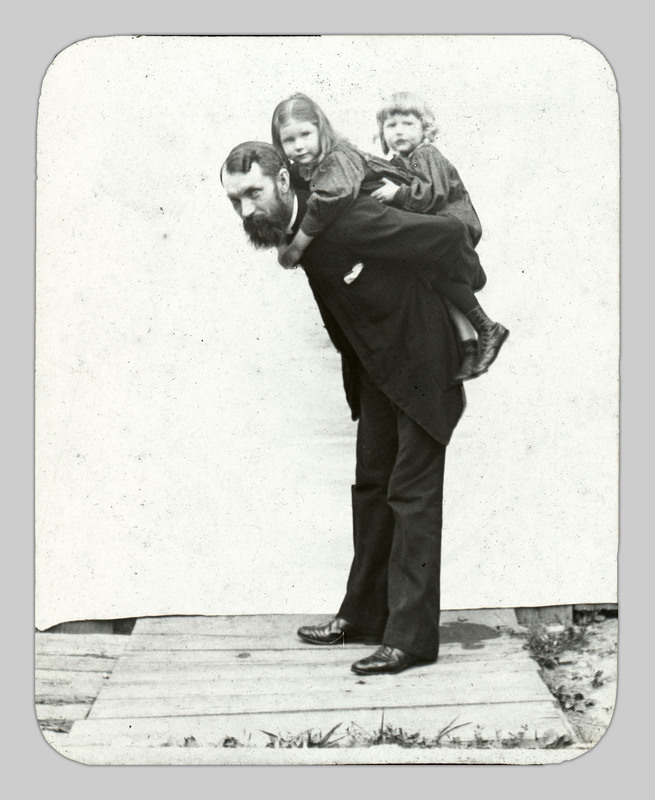 It what is perhaps the clearest evidence of the impact of commercial inventories on his amateur practice, Robinson staged a photograph of him carrying both of his daughters in the Japanese manner (figure 19). Robinson’s wife Bessie likely operated the camera to capture this performance. Amateur photography in late nineteenth- and early twentieth-century Japan remains a severely understudied phenomenon. 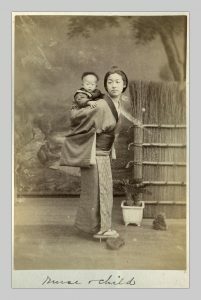 The intent of this essay was to introduce some considerations scholars might bring to future studies of both the UBC Robinson archive and the work of other foreigners who indulged their passion for photography in Japan. However, it is important to recognize the inherent limitations of an essay that focuses on Robinson’s dependencies on commercial studios. While the concerns of this essay are foundational for future studies of Robinson’s photographs, his oeuvre encompasses a rich array of subjects that never found their way into commercial inventories. Robinson was, moreover, the first—and in some cases, the only photographer of any nationality—to record for posterity places and cultural practices unique to the Canadian diocese that have since been lost to modernization. The UBC Robinson collection is thus a uniquely important archive that offers historians of both Japanese photography and Japanese culture countless opportunities to further our understanding of late nineteenth- and early twentieth-century Japan. Figure 19. Photographer unknown: Robinson Holding His Daughters Lucy and Hilda. Source: RBSC, UBC Library: RBSC-ARC-1757-PH-3028 (Click to enlarge, or visit source here). Bennett, Terry. Photography in Japan 1853-1912. 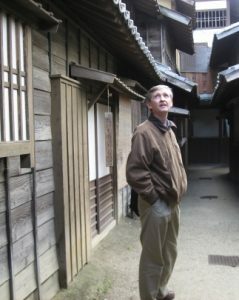 Tokyo, Rutland, VT and Singapore: Charles E. Tuttle, 2006. Hockley, Allen. 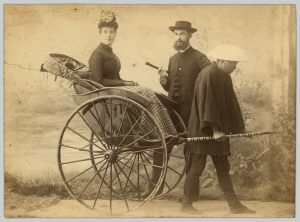 “Expectation and Authenticity in Meiji Tourist Photography.” In Challenging Past and Present: The Metamorphosis of Nineteenth-Century Japanese Art. Edited by Ellen P. Conant, 114-131. Honolulu: University of Hawaii Press, 2006. Allen Hockley received a BA from the University of Victoria, an MA from UBC, and a Ph.D. from the University of Toronto. He currently holds a joint appointment in the Department of Art History and the Asian Societies, Cultures, and Languages Program at Dartmouth College. His research interests include Japanese prints and illustrated books of seventeenth through twentieth centuries and early Japanese photography.